♦ Offline, via an order placed by email, fax, post or any other method. If the information below and our FAQs do not answer your query, please Email us. Our address is 4children2enjoy Ltd, 25 Cambridge Road, Swansea SA3 4PE, United Kingdom. Our Company number is 5026996 and our VAT registration number is GB 826 3366 23. Email communication is our preferred option, as emails enable us to give the highest possible level of service to our customers. 1. we regret that we cannot assist with requests for missing K'NEX parts by telephone. We have a special web page for this. 2. although we have customers all over the world, we communicate in the English language only. 3. the textual information provided with all our products (including instructions and safety warnings) is in the English language only. 4. we accept no responsibility for any inaccuracies that may arise out of translating the English text we provide into another language, via the use of Google Translate, or any other translation process. These Terms and Conditions apply to all orders received from organisations and from private individuals, whether those orders are placed with us online or offline. We do business only under these Terms and Conditions. The use of the terms "we" and "our" throughout these term and conditions shall mean 4children2enjoy Ltd.
We offer three online payment methods worldwide - Payment-by-Credit/Debit-card; Payment-by-Paypal; and Payment-by-Invoice. The payment method on your order may be selected on page "Checkout 3 of 3". We are pleased to offer secure online Credit/Debit card payments to all our customers. Credit card/debit payments are processed for us by either RBS Worldpay or PayPal, two of the world's leading online payment companies, so we never actually see your credit card details. To minimise the possibility of fraud, all Credit/Debit card payments are taken at the point of customer order not on despatch of goods. Credit/Debit card payments must be made by an adult 18 years or older. We cannot be held responsible for any problems caused by online orders being placed by persons under the age of 18. These orders will become the responsibility of the adult who owns the credit or debit card used in the transaction. The second online payment option is to make payment from your Paypal account, if you have one. Simply choose the "Paypal" payment method, and follow the instructions provided. We are pleased to offer offline payment by Invoice to customers worldwide, in GB pounds (£) or Euros (). In the UK only, we offer "Invoice after despatch", to public sector organisations, large private sector organisations, and large charities. It is not necessary to open an account with us in advance. Invoices are raised on the day the goods are despatched. All invoices must be paid within 30 days of invoice date. In all parts of the world, including the UK, we offer payment by "Invoice in advance", if your order has a value of £30/30 or more. If you select the payment option "Invoice in advance", we will email you a Pro-forma invoice with our bank details, so that you can arrange payment via your bank. Once we receive payment, we will despatch your order to you. 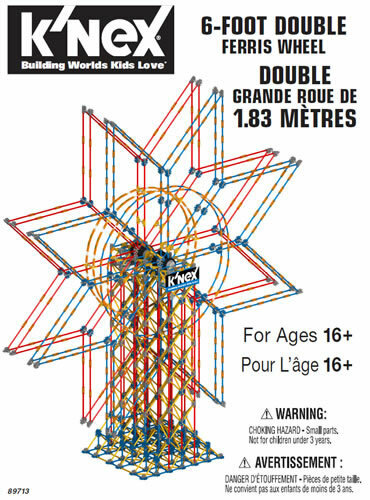 Our online K'NEX shops operate in the following currencies: GB pounds (£), Euros () or US dollars ($). However, during online payment, your credit card company or Paypal account may give you the option to pay in your local currency rather than the currencies listed above, if these differ. Note that all prices displayed in our online shops are exclusive of delivery charges, which will be added to your order in the shopping cart. 1. Providing a wholly secure environment for the online ordering of goods, by using Sellerdeck, one of the UK's leading online shop software development products. You will pay no VAT on your order, but you will be responsible for identifying and paying any local taxes or customs duties that may be charged to you by the tax authorities in your own country. 1. You will have to pay the VAT-inclusive prices if you are a private individual, or a small organisation which is not VAT-registered. 2. If you are a VAT-registered organisation, you will effectively only pay the VAT-exclusive prices. This includes almost all public sector organisations (including schools, LEAs and colleges), and all but the smallest companies and voluntary sector organisations. Note that under UK law, if you are VAT-registered, the order acknowledgement and invoice that we send you must show the VAT. However, your accounts department will claim back the VAT, so only the net cost of the goods will show against your budget. If you are an organisation based in the European Union and have a valid EU VAT number*, you will not have to pay VAT if you enter your VAT number on page Checkout 2 of 3. Otherwise, you will have to pay the VAT-inclusive prices. 1. We show both VAT-exclusive prices and VAT-inclusive prices in our online shops, because we sell to both private individuals and organisations. Smaller orders are sent out by post for the UK or mainland Europe, and by Airmail outside Europe. Larger orders are sent via shipping carrier. Please note that shipping costs for smaller orders include the cost of processing your order and payment, and packing your order, as well as the cost of sending the order to you. 1. "Add to cart" the items you require. 3. On page Checkout 1 of 3, enter the delivery address, including the country and any state/province requested, and select "Next". 4. The shipping cost will be displayed. If your order is too heavy for automatic calculation of the shipping cost, you will receive a message instead at step 4 asking you to Email us for a shipping quotation. When a confirmation of order email is sent to you, this is to indicate that we have received your order. It does not indicate that a contract exists between us. We will indicate acceptance of your order, and hence a contract between us, when we send you an invoice. All products which can be ordered via this website are usually held in stock. We aim to despatch orders for in-stock items within 3 business days, except during our occasional "shutdown" periods, such as Christmas week. In the unlikely event that the product you have ordered has gone out of stock, it will be despatched to you as soon as stock becomes available. We reserve the right to part-ship in-stock items on an order, leaving the out-of-stock items to follow. For heavier orders sent out by shipping carrier, if no-one is in when they try to deliver your order, the carrier will leave a card asking you to contact them. 1. providing a part-complete or incorrect address may cause a delay in delivery. 2. if you request that the carrier leaves your order without obtaining your signature, this is at your own risk. 3. after delivery has taken place, you are responsible for protecting the goods against loss or damage. 4. the set contents of any set delivered may vary slightly from the set contents advertised on this website. 5. if 30 or more of any part is ordered, the parts will be weighed to satisfy the order, not counted individually. This may result in some minor variations from the quantity ordered. 6. Where possible, we deliver larger orders packed in second-hand cardboard boxes. This enables us to minimise our disposal of waste material, and also helps us to keep product prices to a minimum. 7. Some products are available at a lower price if you order a large quantity eg more than 50. We reserve the right to refuse to supply all the stock we hold at that lower price, so that we can maintain a buffer stock for small orders. 8. When shipping orders to countries outside the European Union (EU), we endeavour to meet the documentary requirements of the Customs office in the destination country. However, we do not accept any liability for the Customs office delaying or refusing entry to the order. a) If delivery is to a customer within the European Union (EU), we will ship the two orders together. If there is a significant saving in shipping cost by doing so, we may also at our discretion refund that saving to the customer. b) If delivery is to a customer outside the European Union (EU), we will ship the two orders separately, as sometimes non-EU customers place multiple orders with us to minimise their customs duty payable. You get the benefit of the manufacturer's warranty in respect of all the goods we sell. we will replace those part(s) free of charge. When you purchase K'NEX parts from us, we recommend that you use these in accordance with one of the many official K'NEX instruction books published by the manufacturers of K'NEX, who are based in Hatfield, PA, USA. 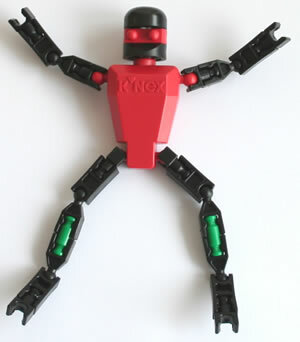 We do not provide any guarantee that K'NEX parts are suitable for any other purpose. When we sell goods and services to organisations we exclude liability for claims regarding the quality or fitness for purpose of goods or otherwise, as permitted under the Unfair Contract Terms Act 1977. We are liable for death or personal injury caused by our negligence. When you place an order with us, you will be asked for your billing address, delivery address and email address. Your email address will be used to send you confirmation of your order, to notify you of despatch, and to contact you to discuss any issues in relation to the fulfilment of your order. We may also email you not more than four times each year to notify you about changes to our website, products and services. You can opt out of this service if you wish. Your delivery address will be used to deliver your order to you. We will only use the email address you enter on your order for the purposes listed above, and we will not pass that email address on to any third party. Your personal information will be stored on our own in-house computer system in Swansea, UK, and will be retained only as long as it is required for order processing and accounting purposes. Your data will be kept secure, and protected from unauthorised access. If you would like us to delete your personal data, please contact Andy Shercliff via the contact details shown on our About us / Contact us web page. Please note that we have never used social media in any form, so there are no issues relating to the privacy of data stored by social media companies on our behalf. Orders may be cancelled at any time up until the time of despatch. You must Email us to cancel your order. On receipt of your email, we will cancel your order, and refund as soon as possible any payment you have made. If the order was placed by an organisation (rather than a consumer) and is cancelled within 48 hours of the planned time of despatch, we reserve the right to apply a handling charge of 15% of the purchase cost. We will then advise you of the procedure for returning the products to us. You must return the products to us immediately, in the same condition in which you received them. c) the payment you made for the defective products will be refunded. We will process any refund due to you as soon as possible and, in any case, within 30 days of receipt of the returned products. Any refund made will include the purchase cost of the products which are incomplete, wrong, damaged or faulty, the delivery charges for sending those products to you, and the postage cost incurred by you in returning those products to us. If you are contracting as a consumer with a delivery address in the European Union, you may cancel an order after delivery, at any time within seven working days, beginning on the day after you received the products. You must Email us to cancel your order. We will then advise you of the procedure for returning the products to us. You must return the products to us immediately, in the same condition in which you received them, and at your own cost and risk. When we receive the returned products, we will process the refund due to you as soon as possible and, in any case, within 30 days of the day you have given notice of your cancellation. We will refund the price of the products in full, including the cost of sending the products to you. However, you will be responsible for the cost of returning the products to us. Before any products are returned, you have a legal obligation to take reasonable care of them while they are in your possession. If you fail to comply with this obligation, we may have a right of action against you for compensation. We will usually refund any money to you using the same method originally used by you to pay for your purchase. All notices given by you to us must be given by Email or by post, using the email address or postal address on our About us / Contact us page. 1. Some parts are offered with a reduced price if you purchase more than a certain quantity of that part. Eg a price of £0.95 each may be reduced to £0.90 each if you buy 50 or more of that part. 2. Percentage discounts may be available if your order reaches a certain value. Eg a 5% reduction for orders valued at £50 or more. 3. All discounts are clearly displayed on our website as you raise your order. There are no "hidden" discounts. 4. We never offer discretionary discounts to the occasional customer who contact us to ask for one. We believe that to do so would be unfair to our many other customers. K'NEX sets and parts come in all shapes and sizes, and as we ship K'NEX orders worldwide, the successful packaging of your order is essential in ensuring its safe arrival. 1. We aim to meet all international guidelines for packaging. 2. Where possible, we re-use boxes and packaging material that we have received from other suppliers. This is good for the environment, and it also helps us to reduce costs, thereby keeping our prices as low as possible. 3. 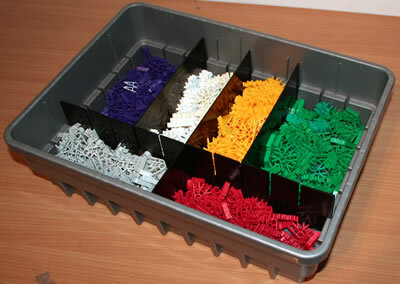 K'NEX parts are usually packed into plastic bags, to protect them from moisture during transit. 4. Delicate parts are also wrapped in bubble wrap or packing chips, to protect them against damage during transit. 5. Whenever possible, small packages are flat-packed into envelopes or mailing pouches, so that they can be posted through your letter box. 6. Larger orders are despatched in sturdy cardboard boxes. We never send out orders in over-size boxes. 7. For express deliveries, we only use major international shipping companies such as UPS and Parcelforce, who in our experience have a good track record of caring for the packages they transport.